Here is my Do It Yourself (DIY) guide to integrate Bob Cooley's Resistance Stretching (RS) methods into your life. Before rushing into the reading material or the exercises it is important to remind you that an open mindset is the first step towards successfully changing yourself. Be prepared to try out new things and different methods, even if they don't seem conventional or intuitive. ​Be ready to diverge from your default patterns - your typical behaviour, your routine thinking and your regular habits. Be curious and keep looking out for new things to expand your horizon and enrich your perspectives. Be aware that things can be hidden in a subtle way and therefore easily missed - especially when one is focused on a particular goal and has narrowed down his/her vision. Remember that a small change (e.g. in your daily habits) can potentially make an impact on your life in the long run. Don't let your ego control your self-esteem and constrain your thoughts. Open your mind and heart to not miss any opportunities to step outside your comfort zone and to start changing your life! 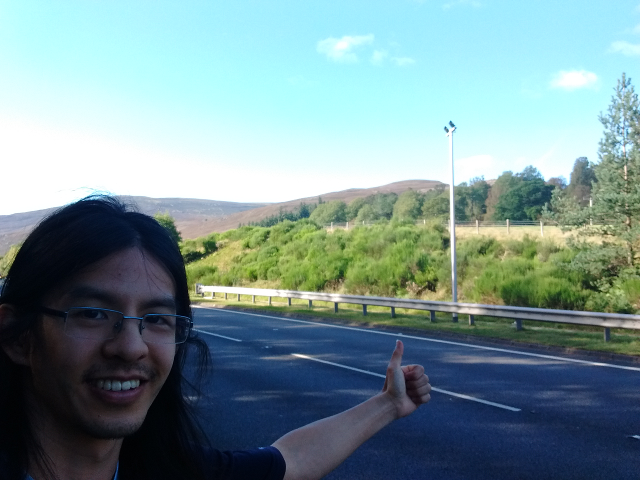 Hitch-hiking in the Scottish Highlands. How is flexibility defined in RS (true flexibility)? How is a resistance stretch performed? What can you watch out for when doing a stretch? Where can you put your attention to during a stretch? What is the aim of a resistance stretch? etc.  This is the site I stumbled-upon before buying Bob Cooley's book. The information on this site and Luther's self-stretch videos convinced me to give RS a try.  Get a copy of Bob Cooley's book Resistance Flexibility 1.0.  Alternatively, I can lend you his older book The Genius of Flexibility. Why doesn't it stay healthy? How can it be changed and kept healthy? What implications can dense or tight fascia tissues have for the body? What does RS do to fascia tissues? What is the purpose of Resistance Stretching training with regards to fascia? Here is a short video that illustrates what fascia is. understand that RS works on a movement pattern as well as a target muscle group. that static stretches or resistance stretches can be used to work energy meridians.  In Bob Cooley's RS, a few meridians have different names (Pancreas is Spleen, Skin is San jiao or Triple Warmer) and 4 additional meridians are added to the conventional 12 meridians usually found in TCM. You don't have to inform yourself in all topics before trying out the stretch exercises. It can give you a new perspective and provide you with a bigger picture, as well as help you to advance in your journey. I would advice to alternate between learning about these topics and familiarising yourself with the RS exercises.  Remember to keep an open mindset, don't get discouraged by unfamiliar content and don't immediately discard unconventional ideas.  Also don't let your ego drag you down (thinking you can't do it) or put you up high on a pedestal (thinking there's nothing to be learnt from the topics). It may take some time to learn how to stretch a muscle while it is contracted. Once you've got the hang of it, you will know when you're doing it correctly. Sometimes you may even feel when dense fascia tissues are being loosened. This experience of loosening up fascia is usually greatest when you resistance stretch dense fascia for the first time.  The release of dense fascia is one of the most satisfying feelings one can have! Often people don't even know where they have tight fascia. Only after they try to resistance stretch certain muscle groups they are able to discover it. So go ahead and try different stretches for the upper or lower body to see how it feels! Go to section Resources for RS Exercises for more stretches! You want to choose a particular set of stretches for the upper or lower body to start doing regularly. The stretches can be very tiring and dehydrating. Make sure to rest and recover yourself fully. The recovery process from RS feels different than normal exercise or workout. Be cautious and don't over-exhaust yourself to the extent that it prevents you from living your daily life.  Keep a personal log book to maintain an overview of your progress! If a stretch feels hard to do or if you find yourself not liking a specific stretch, it means that the muscle group is stiff and that you probably need to work that meridian muscle group. to work on the counter-balancing muscle groups.  Insight into the RS concepts can help you to pick a routine and debug tight muscle groups! constant or repetitive physical work such as years of working as a waiter or waitress, practising and playing an instrument, etc. being exposed to traumatic emotional or psychological experiences - this can be a single event or it could be gradually built up through consistent repetition of life-shaping actions, feelings, thoughts or behaviours. If you have tried the above debugging options to a large extent on tough probem areas, you can try to approach them in a more indirect way. In TCM the meridians are associated with certain behaviour, psychological traits, day time and season. The tightness in certain meridians is to some extent connected to particular characteristics. Changing the flexibility along the meridians will affect your habits and personality; and changing your habits and personality can have an effect on the tightness in specific meridians. If you can't achieve a physical change directly, it may help to approach it from a different, more subtle perspective.  Experiment with altering your daily routines (e.g. diet, sleep or working patterns) and see if it will affect your tight muscle groups. As you continue to loosen up tight fascia tissues, you will gradually notice how the previously difficult stretches become easier. A smooth and controlled resistance stretch means that you have built up enough strength to properly work the fascia tissues and as a result they don't restrict your muscle movement anymore and your flexibility can be increased.  Remember: besides working the fascia regularly by maintaining the needed muscle strength, adapting healthier living patterns is equally important to making this new flexibility sustainable!  For me it is surely one of the most liberating feelings I have experienced! After you managed to remove your personal tight areas and adapt your routine and life style to maintain them healthy, you can keep looking for areas and aspects of life you want to improve. By including the whole energy series in your routine you can explore your range of motion and flexibility of your whole body. There are multiple stretches for each meridian muscle group; each stretch works a different part of the meridian and has a slightly different movement pattern. The many available stretches can help you find areas that are hard to reach; and allow you to work neglected, underdeveloped muscle groups - which are usually hidden and harder to notice. I recommend a systematic approach through the energy series to cover all areas and movements. You can also include variations in your routine such as alternating or repeating cycles between stretches to avoid getting stuck with the same set of stretches.  Remember to rest and re-hydrate yourself and avoid over-exhaustion, which may hinder you from fulfilling your daily duties.  You can also find several sets of stretches for the whole energy series in Bob Cooley's books Resistance Flexibility 1.0 and The Genius of Flexibility.  I put Luther's stretches into a YouTube playlist available here.  @stretchwithchuen is a publicly available Telegram channel where I post stretches and routines. The self-stretches are a great tool to discover, diagnose and treat yourself and can be used to improve the health of your fascia tissues and change your life significantly. While some things can only be done with self-stretches, there is only a certain amount that you can achieve by yourself. On the other hand, there are plenty of things to explore beyond the self-stretches. Watch the interviews with the trainers on The Genius of Flexibility's YouTube channel to hear about their experiences with Resistance Stretching.  I found that each trainer has their own experience and a different insight into the practise. Hearing them talk about RS can give you confirmation on some of the topics or show you a different perspective from what you have learned so far.  The main Genius of Flexibility centres are in the USA. There are also smaller companies opened from former trainers of the Genius of Flexibility, who offer RS services such as Bendable body. Try googling for the terms "resistance", "stretching", "meridian", "flexibility".  Thank you for taking the time to read to the very end. If you're giving RS a try, I would love to hear from you and be part of your journey to change your life!